August 20 , by Mardi Robyn. The inspiration for this necklace came from the designer Marni Paillette Embellished Bib Necklace priced at $420. The knock-off version pictured above cost the blog owner of Inspiration and Realisation roughly $5.00 and it looks just as great as the original! How is that for inspiration! 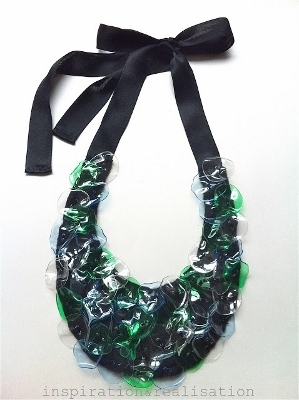 Take a look at the tutorial and learn how to make your own version of this Plastic Bottle Bib Statement Necklace.